Usain Bolt coasted into the second round of the world championships 100 meters as arch-rival Tyson Gay secured the quickest time of the first set of qualifiers in Berlin on Saturday. Bolt, the star attraction of the championships after his Beijing Olympic heroics last year, won the ninth of 12 heats, easing down in customary style in the last 30 meters. His time of 10.20 was modest by his own incredible standards and perhaps confirmation that the track in the Olympic stadium is not conducive to record breaking in the sprints. Bolt set a world record 9.69 seconds to claim Olympic gold in Beijing and has a season’s best of 9.79 going into the world championships. Gay has the season’s leading time of 9.77 seconds and looked impressive with a 10.16 seconds as he began his defense of the global crown. 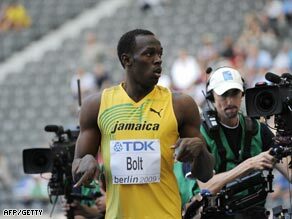 He also holds the 200m title and his showdown with Jamaican Bolt is expected to be the highlight of the nine-day meet. Bolt himself is aware of the threat the American poses as he told reporters on Friday. “My training has been good. I am always confident and mentally strong so I am ready for any big competition. I know that Tyson Gay will put up a big challenge. He is the champion and wants to defend his title but I am going to Berlin to try and dethrone him,” added Bolt. Blog: Bolt unstoppable in Berlin Bolt, who won three gold medals in Beijing, will be in action again in the quarterfinals of the 100 later on Saturday. But his compatriot Asafa Powell nearly missed out after easing down too much in his heat and only qualifying in the third and final position. Britain’s Dwain Chambers, returning to world championship action after his two-year drugs ban and the resulting controversies, impressed with a 10.18 second clocking to win his heat. It stood as the fastest time until Gay set the benchmark in the penultimate heat. He looked untroubled but told reporters after his win that he was still suffering from a persistent groin injury which has hampered his preparations. “I feel okay but my groin felt a little sore,” he said Gay and his U.S. compatriots Darvis Patton, Michael Rodgers and Monzavous Edwards all went through, but 2007 world championships silver medallist, Derrick Atkins of the Bahamas, failed to qualify.